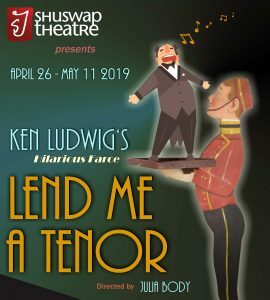 Shuswap Theatre - Entertaining the Shuswap since 1977! It is 1934 and Saunders, the general manager of the Cleveland Grand Opera Company, is primed to welcome world-famous Tito Merelli, known as Il Stupendo, the greatest tenor of his generation, to appear for one night only as Pagliacci. The star arrives late and, through a hilarious series of mishaps, is given a double dose of tranquilizers and passes out. His pulse is so low that Saunders believes he’s dead. Yes, Shuswap Theatre has again been asked (and accepted) to host this year’s OZone Festival. An exciting lineup of seven plays in seven days will keep our audiences and out-of-town guests entertained and stimulated from May 17–24. James Fagan Tait, our adjudicator will provide a brief critique at the end of each show and a detailed “coffee critique’ at 9:30 the next morning. Your ticket provides admission to both the show and the coffee critique. It’s a great way to learn. Yes, the much loved little festival is back for a fifth season of bold and brave theatre July 19–21. We are delighted to welcome Scott Crocker, known to many from his long association with the Caravan Farm Theatre, as the Coordinator/Producer for this year’s festival. Relax between shows with food, drink and free live music at the Edge Club on the patio.